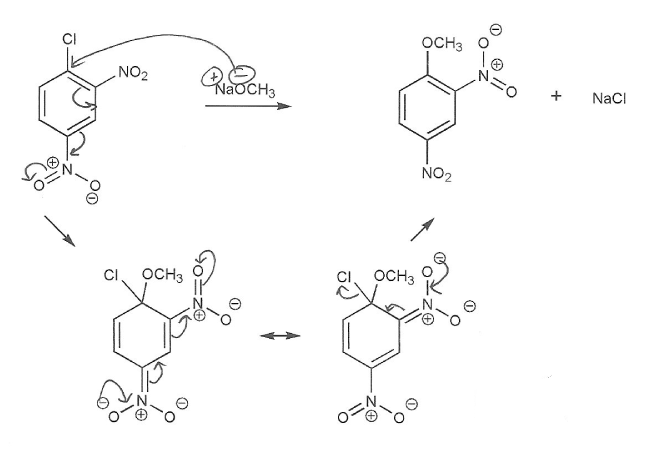 Draw in the arrows to show the electron flow and resonance forms in the nucleophilic aromatic substitution reaction below. 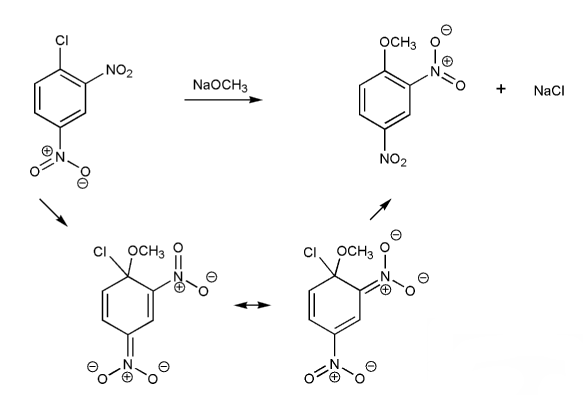 Note: Depending on the textbook, nucleophilic aromatic substitution is referred to as NAS, SNAr, or addition-elimination. SNAr is sort of like SN2, except the leaving group doesn't leave right away; a tetrahedral intermediate is formed first. The trick with SNAr (or NAS, addition-elimination, etc.) is to draw resonance forms that stabilizes the negative charge that forms. That's why EWG increase the rate of SNAr (they stabilize negative charges). MendelSet practice problem # 611 submitted by Matt on July 10, 2011.